"Hello Seattle, I'm listening." Those were the famous words of Dr Frasier Crane as he began his radio program on the hit NBC series Frasier. Admittedly, I was a fan of the sitcom; still watch the re-runs on cable. Frasier was centered around the lives of the Crane family but also playing a starring role was the city of Seattle. The sitcom's portrayal of Seattle was one of absolute sophistication. In the mind of a Caribbean girl, this was the epitome of American life. (I realize now how grossly naive I was.) Thus, began my fascination with the Emerald City. Last month, i finally got the opportunity to visit the city. My college friend, Stephanie, moved out there two years ago and this trip also gave me the chance to visit her. The Seattle Tacoma International Airport is 20 miles or so outside of the downtown area and, since this was where I had to meet Stephanie, I got the opportunity to see the famous skyline for the first time. Not a bad way to start my trip. The beauty of Seattle and Washington State in general is its greenery, lush vegetation and rolling mountains, not to mention Mount Rainier but more on that later. There is no better way to experience a new place than to go where the locals go and do what they do. In the Seattle, the locals drink a lot of coffee. To me, this was interesting because the climate does not permit the proper growth of coffee trees. Later, Stephanie explained that it was that very climate (cold, rainy and overcast) that necessitated coffee drinking in the first place. The best coffee beans, I was also told, were imported from Italy. "Once you've tried Italian coffee you will never go back,'' everyone said. So, the following morning Steph suggested an Italian coffee shop, Cafe Senso Unico. Very unassuming from the outside - I almost walked past it- but relatively expansive on the inside with an additional living-room-like seating area at the back, equipped with a flat screen television. The barrister (clearly also Italian) greeted us warmly with that ever obvious European confidence. Being slightly a creature of habit, I ordered a "regular" which was good but only until I tasted Steph's Americano. Italian coffee is smooth and roasted in such a way as to retain the sweetness of the beans. Needless to say, I think I have found my new "regular." Like any cafe worth it's weight in beans, there was quite an array of edibles to chose from. Fresh, authentic, italian concoctions, both sweet and savory. So impressed was I that I returned the following morning. To my amazement, it was crowded. And loud. I soon found out that the crowd was a group of transplanted Europeans taking advantage of the flat screen TV to watch the Euro cup. Did I mention that they were loud? Unfortunately, too much testosterone doesn't go well with my morning cup of Joe, so I grudgingly left and made my way to the Seattle Aquarium. The serenity of this view of downtown, as seen from a pier at the Puget Sound, starkly contrasts the bustle of the Pike Place Market just two blocks away. Colorful clam at Seattle Aquarium. The aquarium sits on the edge of the boardwalk on Alaska Way and only last year had a $41 million face lift. Guests are immediately drawn to the 40 ft tall, 120 000 gallon tank "Windows on Washington Waters" which showcases marine creatures specific to state. There is a lot to be learnt here, for both children and adults. The most fascinating exhibits to me were Life on the Edge - a close-up look at the critters found in tide pools- and Marine Mammals - this was where all the action was. Sea otters, harbor seals, and fur seals are typically quite entertaining in their natural environment, a trait that is maintained even in captivity. Their antics are amusing, it's as though they know that they are entertaining us. I could have stayed there for hours but unfortunately hunger pangs got the better of me. The Pike Place Market is two blocks up hill and across from the aquarium and I knew exactly where to have lunch. De Laurenti Deli serves up healthy, and not-so-healthy-but-delicious-nonetheless, hand crafted sandwiches, salads, pizza and desserts. It is a busy place with limited seating, mostly bars tools that face the window. Somewhat the feeling of eating in your kitchen, for me it felt more like eating in my grandmother's old kitchen. As busy as it was, De Laurenti's was a great respite from the crowds of the market itself and is a great place to regroup or refuel if you intend to tour the market. Admiring the view from rooftop patio, before The Saint. I just so happened that Stephanie's birthday was also that weekend. We celebrated at a tequila bar called The Saint. A relatively small, crowded and noisy watering hole on Olive Way. It's hard to miss since it is the only bright blue building in the area. Besides their excellent tequila cocktails, the menu also carries delicious appetizers. Pulled pork and the freshest ceviche I've had this side of the Mississippi are a couple of the notables. Another restaurant worth noting is Wild Ginger, a satay joint in the middle of downtown. Here, you can find all sorts of meats and vegetable skewers paired with tangy sauces, as well as traditional Mongolian and Vietnamese dishes. I would suggest making reservations because this is quite a popular restaurant especially on the weekends. At The Saint, despues de los tequilas. On the last day of my trip, I made it to that quintessential Seattle landmark: the Space Needle. Having done that, I will be honest with you: the line was long, the observation deck was crowded, the coffee was way overpriced and one can only truly appreciate the view on a clear day. Thankfully, that day was gorgeous and my patience was rewarded with a stunning view of Mount Rainier and the Puget Sound. Mount Rainier pierces the horizon, just beyond the downtown skyline, in a dramatic reminder of nature's power and beauty. Although I was unable to actually make out there, I am now inspired to start preparing for my second trip to Seattle, specifically to hike the mountain or at least part of it. 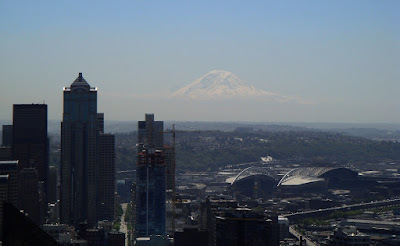 View from the Space Needle; look carefully and you can see Mount Rainier in the background. Although Frasier's Seattle was often lofty and unrealistic, it surely stoked my interest and ultimately brought me here. Once you visit, you will soon see that Seattle is one of the most beautiful American cities. From it's greenery, its majestic snow-capped mountains, its location on the Pacific, its glamorous skyline, and its mix of influences, this city will charm you. I have always wanted to go to Seattle, thanks for sharing your experience. The view from the needle is amazing! You're welcome Reeni! I hope you can make it out there one day; you will have a blast. That's a beautiful series of photos, Natasha. awesome. i have been to seattle and to pike place. its crazy, the way they throw the fish. this was last yr when i did a 10,000 mile trip of the american west by amtrak and driving in 2 weeks! Wow Global Wanderer! That must have been some trip. I can only imagine all the great eats you had along the way. I'm glad you had a fun trip to our fair city! If you ever make it out again, I've got some restaurant reviews that might be up your alley. As a Seattle-ite, I have to say that you did visit some good places that are well known in this city. You're right, this place is filled with coffee drinkers (I'm not one). Seattle is actually a food mecca. Be sure to try out many more of the restaurants the next time you go. Nice blog.